Apollo Command Module VHF/AM Transmitter-Receiver (manufactured by RCA Defense Electronic Products Communications System Division, Camden, N.J.) . Housed in a single case are dual transmitters and receivers for simplex or duplex operation. The enclosure contains 11 subassemblies, two coaxial relays, and two band pass filters mounted within a three-piece hermetically sealed case installed in the Command Module lower equipment bay. Powered from 28 volts dc, the 5-watt (RF output) unit weighs 13-1/2 pounds and is 6 by 4.7 by 12 inches. 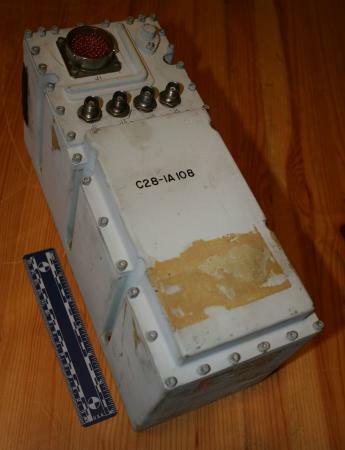 The VHF/AM transmitter-receiver equipment provided two-way voice communications among the CM, the ground, the LM, astronauts outside the CM, and recovery forces, relay of two-way voice from either the LM or extravehicular astronauts to the ground (via the S-band); reception of pulse-code modulated data from the LM; and reception of biomedical data from extravehicular astronauts. The equipment includes two independent VHF/ AM transmitters and two independent VHF/AM receivers. Various modes of operation were possible in both the simplex and duplex configurations. These included Simplex "A" (TX/RX on 296.8 MHZ for voice only); Simplex "B" (TX/RX on 259.7 MHZ for Voice only); Duplex "A" (Transmit 296.8 MHZ/Receive 259.7 MHZ voice and biomed data); Duplex "B" (Transmit 259.7/Receive 296.8 voice and ranging); Receive "A" (Receive 296.8 MHZ only); Receive "B" (Receive Lunar Module data 259.7 MHZ); Relay (Interfaces with the Unified S-Band system for relay to the Manned Space Flight Network). The transmitters and receivers operate on different frequencies and one receiver accepts data as well as voice. The receiver circuits are isolated up to the final common output. The VHF/AM transmitter-receiver equipment is controlled by switches on the main display console and push-to-talk buttons. A squelch control varies the level of squelch sensitivity The transmitters and receivers connect with the main display console, the audio center, and the triplexer. The equipment is connected through the triplexer and antenna control switch to either of the VHF Scimitar omni-directional antennas in the service module or the VHF recovery antenna No. 2 in the command module.